Unless you’ve been hiding under a rock for the last few years it’s virtually impossible to ignore just how fast Facebook has grown. The social network has become ubiquitous in internet users’ personal lives, and most digital professionals’ lives too. The speed at which the social network has grown is impressive, so I thought I’d take some time to look back and get some perspective on the whole thing. 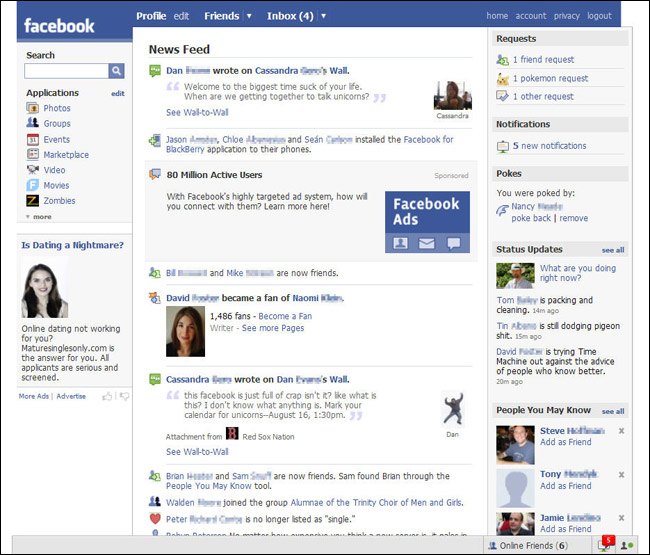 The Facebook homepage has design has changed dramatically in a short period. In terms of Facebook as a marketing channel, Facebook has managed to become a staple part of the marketing mix. It has found a home in marketing plans for businesses big and small, for celebrities, and for anyone else trying to be more open and connected. Thinking back, it wasn’t too long ago that in South Africa you had to procure Facebook ads via Habari Media – and KPI’s were general metrics such as Likes. Now, on the other hand, Facebook has client partners that are emerging around the world as well as a growing local presence in their bigger markets. Facebook’s IPO – Pre and Post IPO Facebook were two very different beasts. Before the IPO it seemed that Facebook’s approach to ads was that they were cool experiments to try to figure out how they might work, and that they weren’t really worrying about them too much (I understand that that’s probably a huge understatement and that, in fact, really smart people probably burned a lot of midnight oil). After the IPO the way they made changes to the design of their product became more rapid and improved in leaps and bounds. Eventually there was a point where it seemed to strike a balance between something the media industry understood and something that would be useful for Facebook users and in line with a bigger vision. Large audience of active users: Facebook is currently sitting at ±1.3 billion monthly active users – your customers are already on Facebook. Different Types Of Media: Social media channels can offer bought, earned, and owned media all at the same time. That’s what makes them unique. Facebook seems to be ahead of the pack at offering meaningful options for all three. Ad Targeting: The extent at which you can target on Facebook is amazing. The best example (I’ve seen) of this is how a college student played a prank on his roommate by targeting ads at only him, so I won’t even try to expand on that. Media Spend: You can run a Facebook ad for almost nothing. With traditional media carrying significant cost, Facebook’s low cost creates a very low barrier to entry for anyone wishing to advertise with them. Another bonus is that if your ad doesn’t use up it’s budget you only get billed for what you use. It’s easy: Another low barrier to entry is that setting up a Facebook ad can be as simple as pushing the “Boost Post” button. A more advanced campaign could be created by spending 10-15 minutes going through some more advanced settings. Granted when you want to get more advanced and start matching Adwords conversion tracking it’s harder, but getting started can take no time at all. It’s advanced: The advanced features aren’t exactly trivial, but there is nothing stopping a power user setting up to advanced features like video ads, retargeting and conversion tracking on websites, online stores, and apps just like on Adwords. Superbalist.com have a great track record at implementing effective digital marketing. 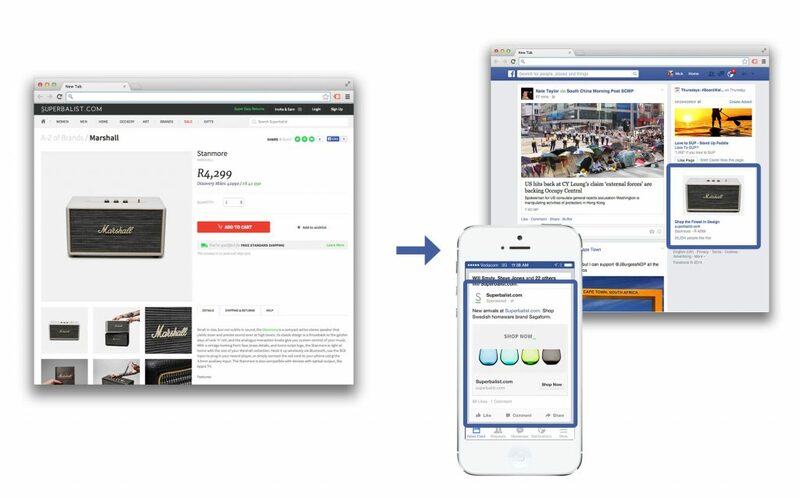 This graphic is an example showing how a visit to a product page triggers Retargeting (Ad of the product) and Remarketing (Ad promoting the brand after visiting the site) and how Facebook support this on web and through their iOS app. Click the image for a larger view. Ad Format: Because Facebook focuses on stories and other non-intrusive content, this means creating an ad that doesn’t clash with user generated content is as simple as typing an ad and uploading an image. Still, the most common types of ads are simply some text and an image, which is very easy for an in-house graphic designer and copywriter to produce. Track ROI: A huge benefit of the platform is how quickly you get feedback and insights. Once you create an ad you can (almost) instantly see what is working with your customers. This means you don’t have to wait until next years media plan, to buy a Nielson report, or to conduct surveys to learn more about your customers – you can get feedback from your customers right away. When advertising on social media started, it was seen by a few brave souls as a way to supplement Adwords, banners and Rich media in existing digital media plans. Now it seems that because the incredible targeting, immediacy of the insights and ability to show ROI, Facebook is now having its influence on advertising and media planning. As the tools that Facebook provides improve, it’s going to be harder for traditional media channels to compete on things like the ease of use, cost of media, cost to produce the media, and the ability to get insights that let marketers make quick data-driven decisions. Then lastly, new entrants into the digital media field will find it more and more challenging to enter the market as the current players, like Facebook and Google, get more advanced creating an even bigger barrier to entry. I don’t believe there is a future of no TV, print, or radio ads, but the pressure to get – and use – insights is reason enough to include Facebook in your marketing mix.